It is a free version of Escape EA with a lot limit set to 0.03. The trading system is based on the breakout of a dynamic price range. Input parameters allow you to track almost any trade channels on different periods. The Expert Advisor can be used as a scalper and for trading using levels. Escape does not use indicators and high-risk techniques, such as martingale, grid trading, hedging, etc. To open deals, the EA sets pending orders at the channel borders at the specified time. Each of the orders has a preset take profit and is protected by a stop loss. If the price has broken the channel border before the time of order placing, no order will be placed in this direction. To increase profits and reduce losses, it is possible to use a trailing stop. The EA has an advanced Money Management system: it can use a fixed lot, automatic lot (depending on the deposit size) and calculated lot (depending on the specified risk level), which allows you to fully control possible losses. For maximum results in the scalping mode, it is recommended to use ECN accounts with a tight spread and fast order execution, fast VPS, and also a rebate service. MagicId — the unique ID of the Expert Advisor. RangePeriod — timeframe for determining the channel size (upper and lower level). RangeSize — channel size (number of RangePeriod periods). RangeMaxRatio, RangeMinRatio — the maximum and minimum allowable ratio of the channel range to the average range over the last 50 periods (e.g. RangeMaxRatio=0.6 means that the channel size must be less than 60% of the average range). ColdStart — instant placing (true) of pending orders at the EA start or re-start, waiting for the opening time (false). HS, MS — time (hours and minus) to place pending orders. HE, ME — time (hours and minus) to delete pending orders or close open orders. MaxLot — maximum lot of one order (set to 0.03 in this version). MainLot — order lot value (for the LotManual mode). LotType — lot selection mode. LotManual — order lot is equal to MainLot. LotRisk — lot is calculated based on the risk level FactorRisk. LotAuto — lot depends on the account equity and FactorAuto. FactorRisk — maximum allowable loss per order, % of AccountEquity. FactorAuto — AccountEquity per each MainLot. Percents — % of the channel range (for Buy Stop orders: 0% is the lower channel borders, 100% is the upper border; opposite for Sell Stop orders). Takeprofit — take profit value. Stoploss — stop loss value. Trailing — enable (On) or disable (Off) the trailing stop function. 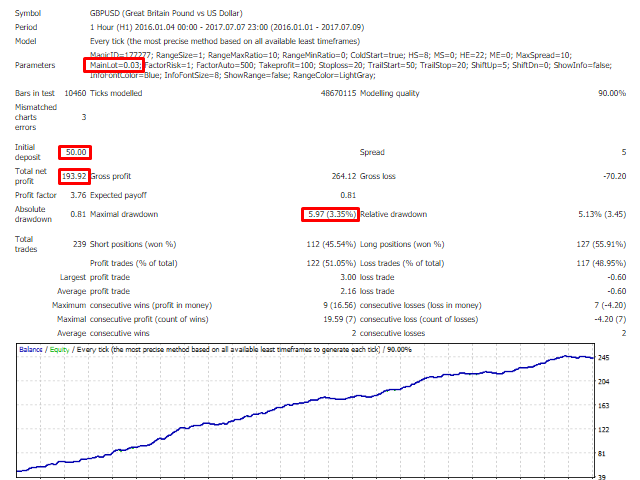 TrailStart — number of pips from the order open price to activate trailing stop. 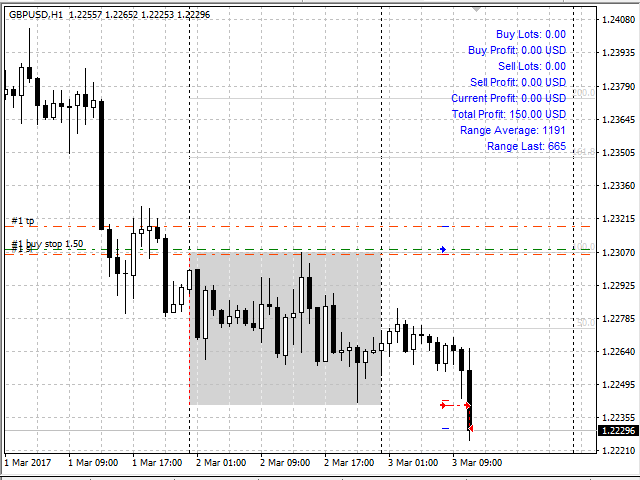 TrailStop — maximum number of pips from the price to the stop loss level in trailing stop. ShiftUp - shift order placing relative to the upper channel border (>0 means above the border, <0 means below the border), in pips. ShiftDn - shift order placing relative to the lower channel border (>0 means below the border, <0 means above the border), in pips. ShowInfo — show (true) or hide (false) the information panel (it is advisable to disable the panel during testing and optimization). InfoFontColor, InfoFontSize — the color and size of the text shown on the info panel. ShowRange — enable (true) or disable (false) the visual display of the channel and Fibonacci levels (it is advisable to disable during testing and optimization). RangeColor — the color of the channel and Fibonacci levels. В тэстере красиво бацает.А дальше видно будет.